The European Patent Organisation can invoke jurisdiction immunity in a dispute with trade unions. That is the ruling issued by the Supreme Court 5 today, and means the Dutch courts have no jurisdiction to examine disputes brought before them between the European Patent Organisation (EPOrg) and two trade unions: the Trade Union of the European Patent Office (VEOB) and the Staff Union of the European Patent Office (SUEPO). Previous rulings by the court in preliminary relief proceedings and the Court of Appeal in The Hague 10 have been set aside by the Supreme Court. 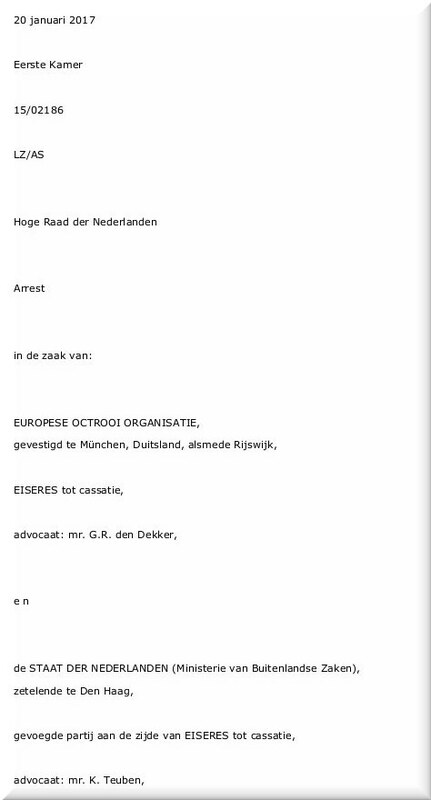 Original judgment text is in Dutch. English translation is available.